with their delicate lines, details galore and distressed finishes? Accentrics Home by Pulaski furniture is one of my favorite lines to preview in High Point- and I am always inspired by it. The colors, the style, the finishes and all.those.details. They are truly beautiful pieces that would fit in so perfectly with my home and style. I was so excited to be able to interview the brilliant designer behind that amazing line and learn more about it. I caught up with Tracey last week and had such a fun conversation with her. Not only is she extremely talented- she is so sweet as well. I have been designing as long as I can remember. 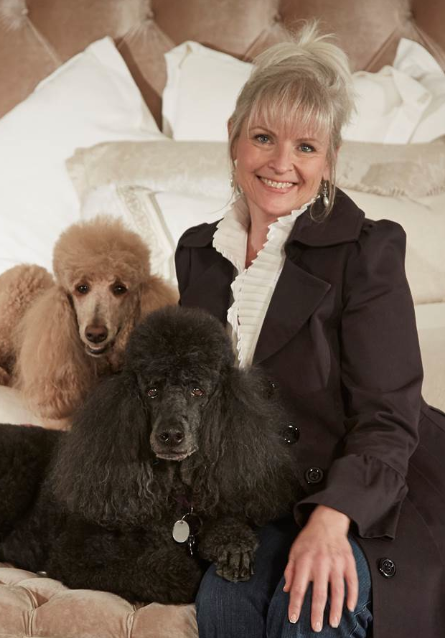 Tracey’s artistic vision is simply to create luxurious products that make homes more beautiful, add harmony and balance, and enrich the lives of people they touch. I really want women to be inspired by the ability to create a sanctuary in their own home. I want them to be lit up by their style and delighted by their choices in home furnishings. Often destined to become family heirlooms and favorite pieces, all my furniture designs are based upon my sense of style and what women are looking for and I have always felt there is room for more beauty in the world so I create pretty furniture. 2. Where did your inspiration for the Accentrics line come from? I was getting away from a traditional interpretation of furniture. Everything was more formal and dark and I love beautiful antiques, european and french pieces. So I took classical pieces and elements that I like- and interpreted them in a more casual way- with the finish being a big part of the look. I wanted them to look as if they had been made in a stained darker walnut originally, and the finish wore off over time, or someone painted it and then someone else stripped it down to what it looks like now. With the idea being that they have been recreated with a cottage charm- and feeling natural and inspired. The Accentrics Home pieces with their well worn, well loved look exude a certain tug at the past- like a heartstring. You know you have seen it before and you love what you see because it feels like something familiar- like it has a history or past and yet fresh at the same time. The few things that call to me are the charming aspect of antiques mixed with a fresh new distressed patina. The shapes of pieces are often classic and pretty pieces in any finish. I start with bone structure and give it extraordinary makeup. I pick things I like that I would buy. I think the most important pieces exude charm and have finishes that have a great patina that is difficult to find in the marketplace for this price. 3. How is that gorgeous beautifully aged finish achieved? I start with a few photos for a direction and the next choice is the wood grain. I want knotty wood with cherry color to start or simple white oak or pecky pecan - wood is key and then we will work with the color and paints and wood grain until the finish is right. On this small chest~ there is no less than 7 hours of work to achieve that well worn, well loved finish and get everything to be just right. There is no formula, just all handwork and reapplying, removing, etc until the aging and finish is perfect. 4. One of my favorite pieces ( though I love them all!) is this little chest. Was there an antique piece that inspired it or where did the inspiration for it come from? There isn’t just one antique piece that inspired it. I travel to Paris and wander through the shops. Not just furniture shops- the dress shops , cheese, flower, antique stores, etc. and I have an archive of probably 25 years of taking pictures from all over the world. So visually, this chest is a conglomeration of several pieces. That is how I design. I take pieces and paste them together. A big chunky drawer, this foot, that carving. It's really organic. I start with a few photos and the computer and am pasting it up until the piece is designed. For instance, one of the dressers in Accentrics Home has a drawer pull made directly from an antique...when I first saw it, it was all alone in a box of junk handles in a dealers store in California, I was immediately taken with how delicate and refined it was. I knew there was nothing as pretty from my stock hardware choices so I bought the antique and had it cast. 5. Another favorite piece is this bed- what inspired that gorgeous detail? The Ardenay bed was based on an artfully hand carved antique 18th century picture frame which was unique and very opulent. I found the frame locally however It was reminiscent of frames from the period and very similar to some I have seen in Paris and from dealers in NYC as well. Most of my designs are inspired from something I see that is pretty or unique and usually I find elements in antiques that I find endearing. I travel to Paris every few years just to soak up the beauty and view antiques but I find inspiration all over Paris. and artful sense of style in France are just so yummy. 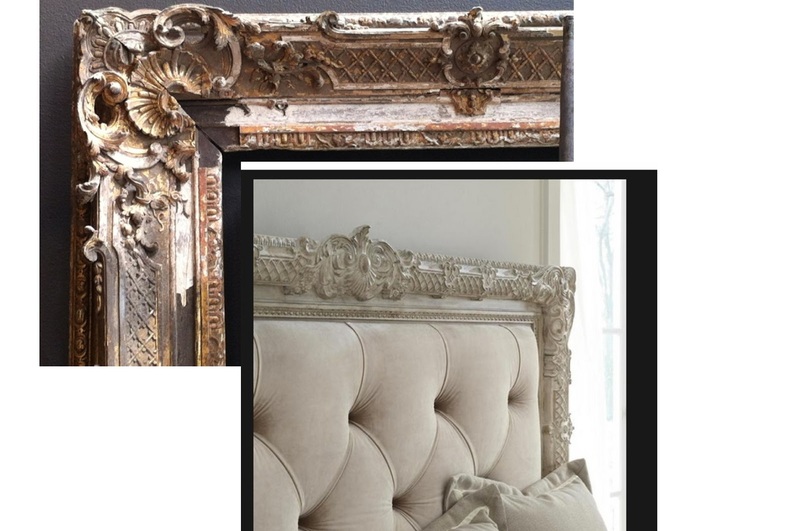 The frame made me think that it would make a fantastic tufted fabric headboard frame as I had seen so many recent versions of old architectural elements becoming other things it just seemed like a natural fit. In fact, many things that are old have qualities we rarely see these days and I love the idea of having those things re-invented. 6. Do you have a favorite piece or one that is special to you? Probably the same small chest that you love. I love the character of it. 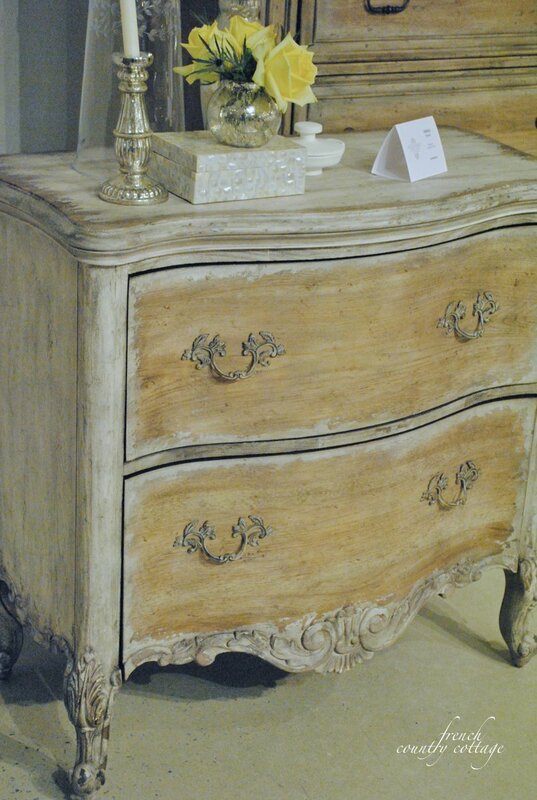 The combination of the wood and distressed paint together is magical. 7. How did you get started designing furniture? Was this always something that you dreamed of doing? I got started because I was a buyer and I was asked to leave buying and start making upholstery. I did that for 5 years and got the itch to do more with the product. Then, the right doors opened and I walked through them and before I knew it, I was on my way to designing what women like- yay! I always knew that I would be making things and creating stuff. When I was younger- it was Barbie furniture and clothes. I have been making things as long as I can remember and I always hoped that I would be a famous interior designer. But I could not stand not completing projects when the client would change course in the middle or drop the project to start a new one. I wasn’t good at the sales aspect of design and was much better at the design aspect. Working with furniture in a showroom and staging and designing spaces every 6 months is different. It was a fantastic privilege to make beautiful rooms and have a deadline for opening day of furniture market- it worked great for me. The audience was huge and so inspired by design, it was a blast and fun working until opening night. Market opens and you were done and then you start over again for the next one with tons of great new ideas. I didn't know that I wanted to design lines of furniture but when I worked with freelance designers as a VP in product development, I discovered that I was always telling them what to draw and what to do and I realized that I should just be doing that. So I transitioned into doing that and I always worked hard. Designing furniture and lines is a gift that comes through me- it is not something you learn in school or go to school for- you have that gift. and I really think you just have that gift or not- it's kinda hard to explain. It's like I cannot not do it!! Thank you so much for taking the time to chat with me and share your story Tracey! I loved doing this interview and talking with Tracey- she was so inspiring in so many ways. I am looking forward to meeting with her in person in High Point this Fall. that we talked about in this post as well. I was compensated for the post by Pulaski Furniture but all opinions are my own, of course. Great interview...I love the finish and design of those beautiful pieces!...I have purchased Pulaski furniture and have been truly happy with it. I love their furniture too- so beautiful! I do love these pieces and they are so gorgeous! I want that bed and the chest!!! These are beautiful pieces of furniture. I always gravitate to worn, old and detailed furniture. I just came back to read the interview again. Such lovely pieces. I find it interesting that they're commercial, yet everything we strive to achieve ourselves, in our "renewing" old pieces of furniture. It surely sounds like she has a personal stake in every piece she designs! Don't find that every day. Thanks for the interesting conversation.